As we all know, most of the aluminum foil are produced as roll shape, also called aluminum foil roll. For it is easy for store and transport, because different from aluminum sheet plate, the aluminum foil is very thin, if it is produced as plate shape, little damage will affect its surface and performance. During the production process, aluminum alloy are rolling into aluminum foil, after some length it will cut into aluminum foil roll. 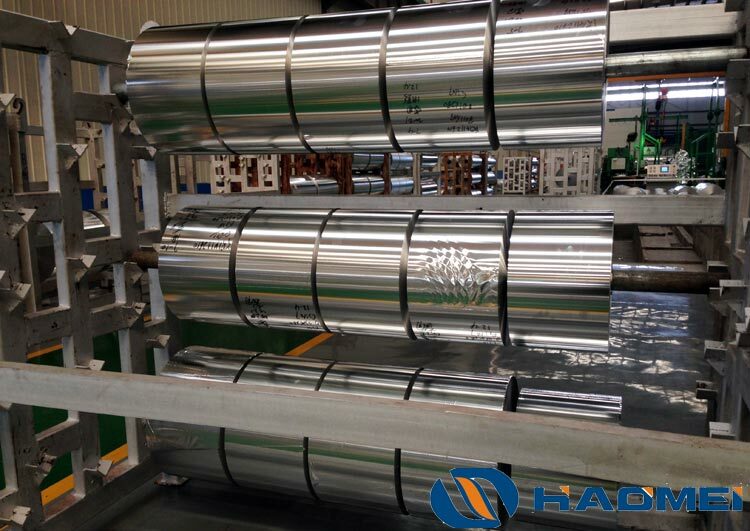 With different thickness, different width, aluminum foil roll are used in different field. As aluminum foil is a kind of high quality material, it has waterproof, oil proof, light insulation, heat conduction, heat preservation and other functions, it is recyclable and environmental protection. Because of its unique comprehensive properties, it has been widely used in food packaging, pharmaceutical packaging, aviation, electronics, machinery, building decoration and other fields. Our company specializes in the production of household aluminum foil, catering aluminum foil, container aluminum foil and soft packaging aluminum foil, etc.. According to different areas of use, the model has 8011, 3003, 1235, 1050, etc., the temper has O, H18, H22, H24, etc., the main specification is 80-1500 mm wide, 6-200 microns thick.